In the 1950s, car owners imagined a family road trip without having to drive. 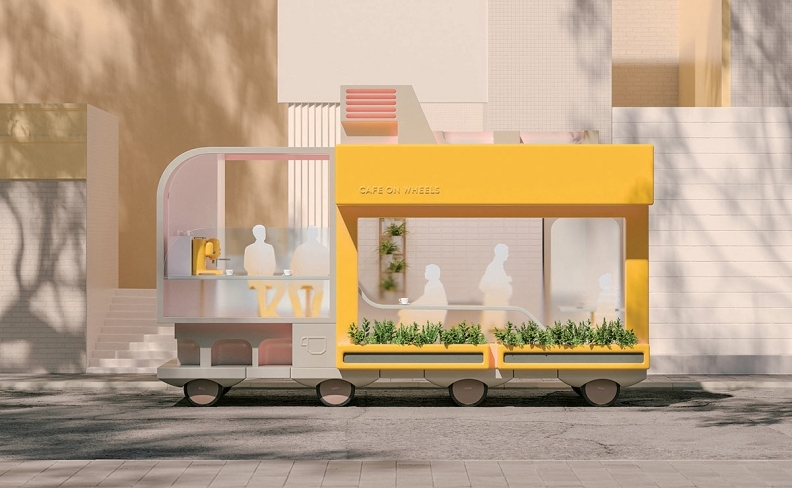 For as long as the possibility of self-driving cars has filled the imagination, there have been parallel dreams of what people might do inside their vehicles once freed from the monotony of driving. When the idea of vehicles that drove themselves took hold in the 1950s — with electric infrastructure embedded in highways as a guiding principle — one particular sketch came to encapsulate notions of how passengers would spend their time: A family sits contentedly around a small table, playing a game of dominoes. If not for the steering wheel behind Dad's left arm, it'd be easy to mistake the setting for this wholesome family activity for a living room instead of a vehicle hurtling down a highway. As the widespread deployment of autonomous vehicles becomes a more plausible, and perhaps even inevitable, development, automakers and their tech-minded counterparts have doubled down on interior concepts like the one envisioned six decades ago. But for all the excitement, these ideas are further away than most people think because they are simply too dangerous for passengers. Accidents that seem minor today take on a whole new level of danger once the passengers move out of a traditional forward-facing belted-in position. "Some visions of the future give me the chills," said Steven Peterson, vice president of engineering at ZF. "Restraints need to change completely. Small changes to the interior can have a dramatic impact on safety." 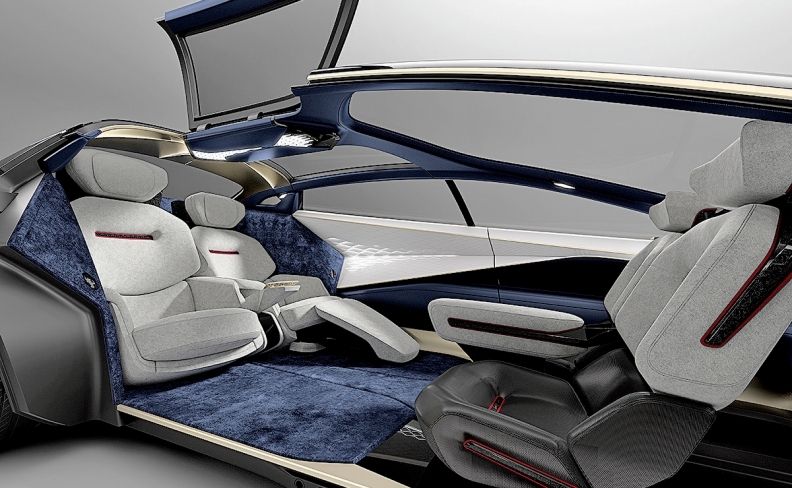 Modern-day car interior visions include everything from reclining seats as seen in Volvo's Concept 26, to more radical cabin redesigns that feature mobile offices, swiveling seats, even exercise equipment. 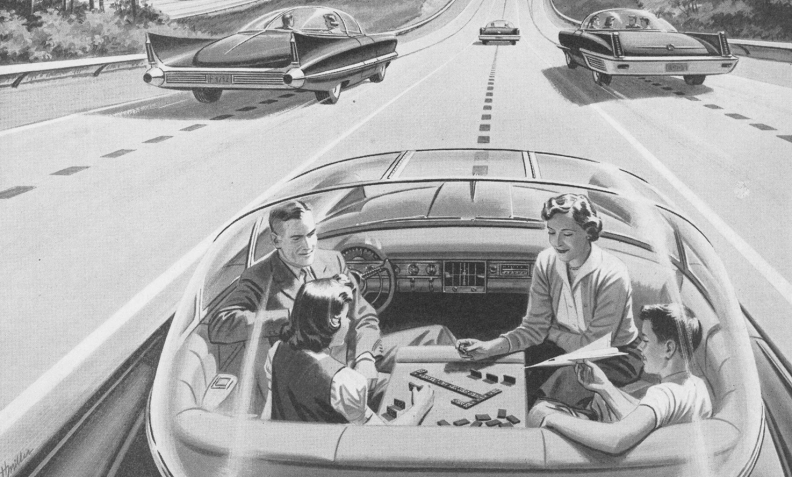 If you look more closely at the 1950s-era rendering, you'll notice that what's missing from the picture is as important as what's presented: None of the family members is wearing a seat belt. The three-point harness wasn't invented until 1959, and airbags didn't arrive for more than a decade later. 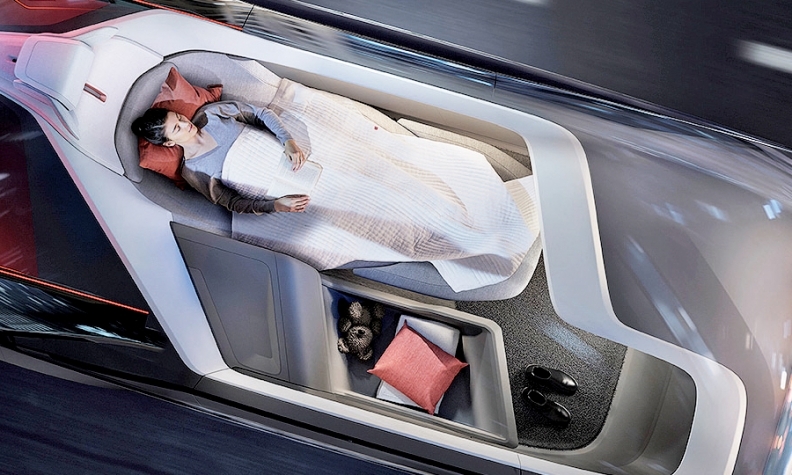 Seat belts and airbags have saved hundreds of thousands of lives, and future-minded cabin designers must account for how to protect occupants who are spun backward, lying down or sitting at desks. But the process of building and vetting safety systems for modern novel seating positions has barely begun. Experts warn that implementing them without careful consideration of safety could cause more traffic deaths and serious injuries, undermining the promise that self-driving vehicles will be safer than cars driven by humans today. In an autonomous car, seating options could be more relaxed, raising safety issues. As industry engineers, regulators, insurance executives and safety advocates embark on the years of research, engineering and testing needed to deliver a future that frees motorists from traditional seating positions, they might start by looking at another picture. One that doesn't depict an idealized future, but one from the present that provides a glimpse of potential dangers. On Oct. 6, a 2001 Ford Expedition stretch limousine in Schoharie, N.Y., veered down a hill, through a stop sign, into a parking lot, finally coming to rest in a ditch. Seventeen passengers in the vehicle, its driver and two pedestrians were killed, making it the country's deadliest transportation crash in nine years. Although the limo was not self-driving, it could be a harbinger of what happens when passengers move out of traditional seating positions. The National Transportation Safety Board is investigating the crash. While no conclusions have been reached, speed, braking, and the vehicle's maintenance history have drawn early focus in a concurrent investigation run by the New York State Police. Another potential factor: Seating positions and seat belts. "One of the things we look at is to see whether or not the seating configuration may have — may have — contributed to the injuries," said Robert Sumwalt, chairman of the NTSB. "We've had questions on whether or not the seats were equipped with seat belts. … At this point, we're not sure if all the seats or seating positions were equipped with seat belts, and not sure at this point if the seat belts were worn by anyone." The crash could lend insights on how regulations need to be developed. Safety advocates say current federal motor vehicle safety standards are inadequate for limousines, which are typically built by chopping a regular car in two and lengthening it. Those federal standards apply only to a new car rolling off an assembly line. If side airbags get removed or rendered inoperable during the limousine retrofitting, there's nothing from a regulatory perspective which deems that insufficient. "Here, the lack of standards becomes clear," said David Zuby, chief research officer at the Insurance Institute for Highway Safety. "This horrible crash in New York, that's in part because there's not any occupant protection. So this is a problem that already exists today." The problem could escalate. Although self-driving vehicles are being developed with the noble idea that they'll dramatically reduce the number of traffic deaths, they will still need to contend with cars driven by humans for decades. Once autonomous cars become widely available, it could still take 30 years for the nation's collective fleet of 260 million human-driven vehicles to be gradually replaced with vehicles equipped with self-driving technology. Until that happens, passengers in cars with unconventional seating arrangements may be in hazardous positions. Not only do they vary from optimal positions, researchers from the University of Michigan wrote in September 2016 that "some of them also have the potential to be near-worst-case positions or postures, with G-forces imparted upon occupants during crashes and abrupt stops in ways that are likely to result in more serious injuries than conventional, forward-facing seating." Safety experts and researchers want to start examining these potential future cabins, and in some sense, that work has started. Officials with NHTSA have conducted working groups at the Transportation Research Center in Ohio, and the Virginia Tech Transportation Institute is reviewing federal motor vehicle safety standards to determine which might present barriers to the implementation of unconventional cabins. Those discussions have included the idea of developing new crash-test dummies that could offer fresh insights on how the human body might fare when lying down or sitting at an angle. Current dummies are all situated with frontal crashes in mind from established seating positions, and it might take a full decade before a new dummy can be vetted and crash protocols and standards agreed upon and codified into standards. "If you take these crash-test dummies developed over 20 or 30 years, you don't know how it's going to perform in different types of crashes, with the forces coming from the back instead of the front or whatever," ZF's Peterson said. "So the tools need to change. That is one challenge." In the meantime, the federal government has released a policy on automated vehicles that has invited automakers and tech companies to apply for exemptions to federal standards. If they can prove their autonomous innovations provide equal or better levels of safety, they may still be given the green light to deploy vehicles that don't necessarily conform to existing standards. But the idea of vehicles that don't meet federal standards for conventional passenger protections is one that bothers Zuby, and it's one that might ultimately cost consumers money. "It's absolutely a concern for everybody," he said. "If vehicles don't or can't meet current [federal standards], then what are the current implications for insurance? Does insurance not pay off if passengers ride around in cars that don't conform to the current standards? Or do insurance costs have to go up because more and more people ride around in cars that don't offer the same protections we're used to? Way out in the future, if automated technology can ultimately deliver on its promise in full, there won't be crashes or the ones that occur will be minor. But until we get there, it'd be a bad idea to say, 'Let's not design these cars to be crashworthy.' "
In thinking about designing a cabin that still protects its occupants in a crash — but takes into account the possibility that people are no longer sitting in locked, forward-facing seats, engineers need to shirk traditional notions about airbags deploying from steering wheels and seat belts anchored to the vehicle itself. They're starting to consider alternate configurations with two basic ideas. One is that passengers might be in rear-facing seats. That's a position known to cause motion sickness in some occupants, but from a crash-protection perspective, it could actually be helpful. Instead of deceleration forces concentrated on restraints, new seats could be designed that disperse crash forces. The same reasoning behind placing infants in rear-facing car seats would essentially become helpful for keeping adult passengers safe. Second, they're working on prototypes centered on the idea that restraints and airbags will be situated around or within seats instead of the broader vehicle infrastructure. Seat belts might travel with seats as they swivel and airbags might deploy from headrests. "It makes the seat take on a whole bunch of new requirements to withstand the energy of a crash and it makes the seat more complicated, but that's not an unheard-of challenge," Peterson said. "It's not conventional, but you can develop that system. Still, there have to be some assumptions. You can't have an infinite number of scenarios." Much like automakers have developed camera-based driver-monitoring systems to pair with early driver-assist or partial-autonomy systems, he envisions developing interior observation systems that can detect which occupants are belted, which airbags would be most beneficial and deploy restraints in real-time to adjust for ever-changing circumstances. Reimagining the way restraint systems may keep passengers safe is made difficult by the prospect that the nature of crashes may change with the introduction of autonomous vehicles. Frontal-impact crashes currently account for approximately 54 percent of all vehicle occupant traffic deaths, according to IIHS and the Highway Loss Data Institute. Side impacts account for 20 percent of deaths, and "other — mostly rollovers" claim 24 percent of the occupant fatality total. Over decades, crash-test protocols, regulations and engineering solutions have all evolved to address those crashes, with the advent of things such as the IIHS' small-front overlap test, side-curtain airbags and more robust federal motor vehicle safety standards. "Government and agencies always follow the injuries," Peterson said. "If they see the most fatalities are from frontal impact, that's where the focus will be. We wouldn't want to have new interiors and have some new type of injury. We want to be ahead of the curve." While there aren't yet new types of injuries, there's already evidence that crashes of the future will be different. Anecdotally, manufacturers are already finding vehicles in their self-driving test fleets are rear-ended at a rate more frequently than cars driven by humans, though experts caution the sample size is too small to draw meaningful conclusions. At the same time, the number of frontal crashes could decrease in a fully autonomous era. Features such as collision warnings and automated emergency braking are already reducing the number of frontal crashes in cars equipped with these systems. A May 2018 study issued by IIHS compared police-reported crashes for vehicles with and without the technologies. Findings suggest collision-warning systems alone reduce front-to-rear crashes by 27 percent. Collision warning coupled with automatic braking has reduced front-to-rear collisions by 50 percent, and the number of those crashes with injuries has fallen by 56 percent. These systems are reducing the severity of crashes and eliminating others. But Matthew Doude, associate director of the Center For Advanced Vehicle Systems at Mississippi State University, cautioned about correlating the performance of driver-assist systems with those in a fully autonomous future. "What we've seen is the opposite of the future," he said. "Primarily because we have a computer backing up a person. In a totally autonomous vehicle, we'll have a computer without backup, and that's a little bit different." While no one has a crystal ball, that would indicate computer-controlled systems may be very capable of preventing crashes or reducing the severity of crashes in situations where imminent collisions are detected. But if hazards are not detected or misinterpreted, fully autonomous crashes may be more severe. In March, an Uber self-driving test car struck and killed a pedestrian who was pushing a bicycle across a road in Tempe, Ariz. The vehicle had detected Elaine Herzberg six seconds before impact, but the self-driving system in control of the vehicle classified the pedestrian first as an unknown object, then as a vehicle, and finally, as a bicycle, each bringing a different expectation for her expected trajectory across the road. The system did not begin emergency braking until 1.3 seconds before impact. Had the car begun braking when Herzberg was first detected, vehicle speed could have been further reduced, increasing the chances of her survival. (Of course, if the human safety driver aboard had been paying attention instead of watching "The Voice" on her cell phone, the vehicle wouldn't have been fully dependent on the self-driving system to thwart the crash, which has come to symbolize the worst of both the human-driven and autonomous realms). Fatal crashes that have occurred while Tesla's Autopilot system has been enabled further illustrate the potential for severe crashes. Although Autopilot is a pure driver-assist feature, which requires human drivers to retain responsibility for vehicle operations, several crashes have shown the consequences of human inattention coupled with a computer system that misinterpreted the path ahead. On March 23, 2018, Walter Huang's Tesla Model X drove on Highway 101 in Mountain View, Calif. Three seconds before his car veered into a highway barrier, the car sped from 62 mph to 70.8 mph, and it did not break or attempt to avoid the collision, according to a preliminary NTSB report on the incident, in which Huang was killed. The NTSB has undertaken investigations related to both the Tesla crash in Mountain View and the Uber crash in Tempe, as well as two other collisions involving driver-assist or self-driving technology, as part of an early push to understand the implications of autonomous driving on future traffic safety. Broadly, that future promises dramatically fewer traffic deaths and other societal benefits. "When cars don't crash anymore, you can do all sorts of things to save cost and weight," Doude said. "You can remove crumple zones and airbags. Cars can be made out of carbon fiber, and weigh half as much, and that in turn affects fuel economy. There's all kinds of trickle-down effects. That's the pot of gold at the end of the rainbow." None of that can happen until crashes caused by human error or behavior are eliminated, or until the fleet shifts over decades from human-driven vehicles to autonomous ones. 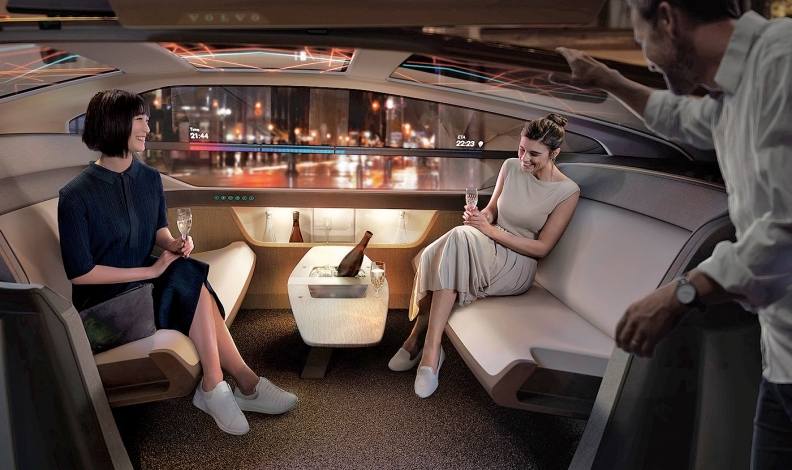 But to eliminate deaths and injuries, unlock fuel and emissions benefits, and permit the wider use of cabins for all sorts of seating positions and activities, those self-driving vehicles will need to eliminate mistakes. Right now — and for the foreseeable future — that level of perfection is still a ways off.